Do you want to create an Amazon affiliate store using WordPress? An Amazon affiliate store allows you to sell products from Amazon.com as an affiliate and earn a commission on each sale. Due to low overhead, an Amazon affiliate store is among the easiest to start online business ideas at the moment. 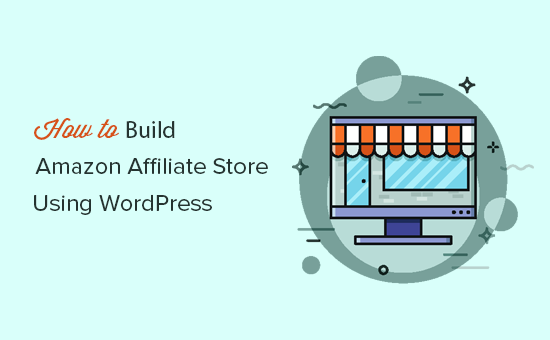 In this article, we will show you how to easily build an Amazon affiliate store using WordPress. We will also share our expert tips on growing your Amazon affiliate earnings. Here is a quick overview of all the steps we will take to create an Amazon affiliate store using WordPress. What is Amazon affiliate store? What is an Amazon Affiliate Store? An Amazon affiliate store is an online store that promotes products listed for sale on Amazon.com. As a store owner, you send traffic to Amazon by adding your affiliate links to the products. Users are redirected to Amazon to complete the purchase, and you earn an affiliate commission on each sale. On a traditional online store, you source products, manage orders, ship products, and keep track of inventory. You don’t have to worry about any of these things on an affiliate store. Amazon affiliate stores are popular among marketers because you can get started with very little money and choose from millions of products listed on Amazon. You can start an Amazon affiliate store with just about any WordPress eCommerce plugin, but we recommend using WooCommerce because it’s the most popular solution in the market. WooCommerce powers millions of eCommerce websites all over the world. To get started, you will need to be using the WordPress.org platform (See the difference between WordPress.com vs WordPress.org). You will also need a WordPress hosting account, a domain name, and an SSL certificate if you want to accept payments for other non-affiliate products on your website. Typically, a domain name costs around $14.99 / year, web hosting costs around $7.99 / month, and SSL certificate costs around $69.99 / year. If you are just starting out, then this is quite a lot. Thankfully, Bluehost, an official WordPress and WooCommerce recommended hosting provider, has agreed to offer our users a free domain name, free SSL certificate, and a discount on web hosting. Basically, you can get started for $2.75 / month. Note: This starter hosting plan would work great for any new affiliate store. However, if you want more eCommerce centric hosting, then take a look at our pick of best WooCommerce hosting providers. After purchasing hosting, follow the setup instructions in our how to start a blog article. It will walk you through the sign up process, and setting up WordPress. 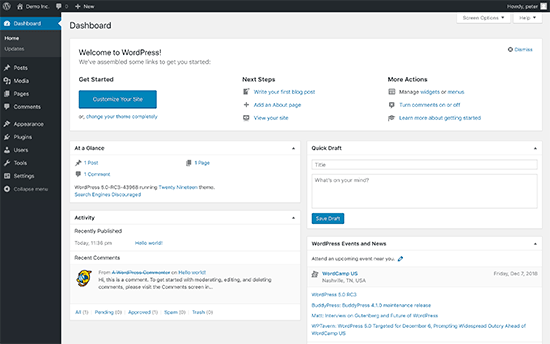 Once you have installed WordPress, you’ll reach the WordPress dashboard which looks like this. Next, you need to install and activate the WooCommerce plugin. For more details, see our step by step guide on how to install a WordPress plugin. Upon activation, WooCommerce will start the setup wizard to choose the currency, payment methods, location, etc. Since you are setting up an affiliate store, you can scroll down to the bottom of the page and click on ‘Not Now’ link to skip setup. You can configure each option in the set up later if you need it in the future. 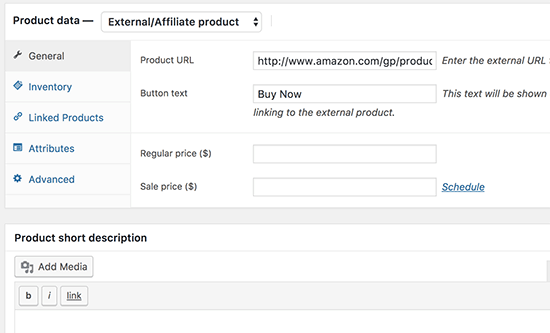 Now that you have installed WordPress and WooCommerce, you will need to sign up for an Amazon affiliate program to start adding products with your affiliate ID. Head over to Amazon Affiliate program website and click on the ‘Join now for free’ button. 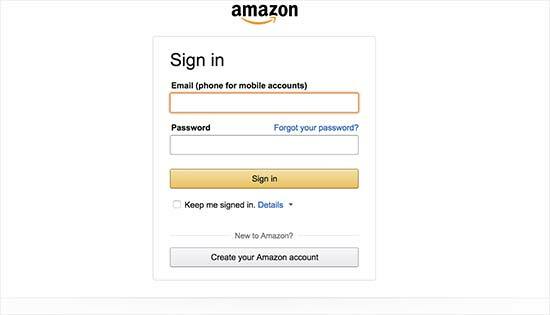 Next, you’ll be asked to log in to your existing Amazon account using the email address and password associated with that account. If you don’t have an Amazon account, then you can go ahead and create one. Once you are logged in, you’ll need to provide payee information and answer questions about your website. Follow the on-screen instructions to complete your profile. Upon completion, your application will be reviewed and approved by Amazon. WooCommerce is the best Amazon affiliate store plugin for WordPress. It makes it very easy to add external affiliate products to your website. Using WooCommerce allows you to offer a native user experience and integrate affiliate products seamlessly into your website. To start importing products, you need to visit Products » Add New page. First, you need to provide a title for the product you are adding and then add a detailed description in the post editor. After that, scroll down to product data meta box and select ‘External/Affiliate Product’ under ‘Product type’ dropdown menu. Now you need to enter the product affiliate URL. You can get the URL from your Amazon Associates account dashboard. Simply search for the product and then click on the get link button. 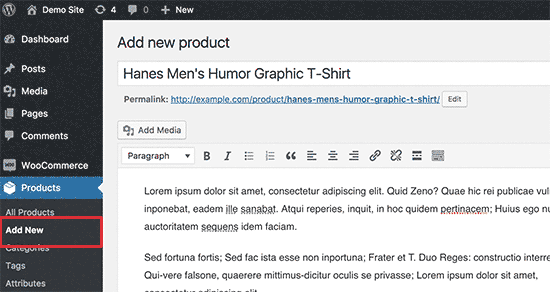 Copy the URL and paste it on your product edit page in WordPress. Note: You need to leave the ‘Price’ field blank. This will allow users to check the price on Amazon.com. Amazon’s affiliate program policies do not allow you to manually enter price information. Below the product data, you can provide a short description of the product. This description will appear on the shop front page, product category pages, and search results. 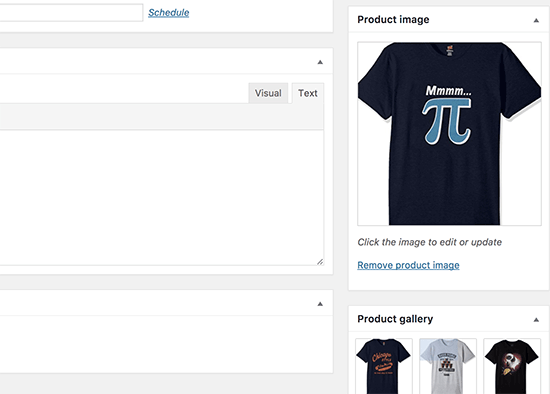 To your right, you can add a product image and product gallery images. You can now click on the publish button to make the product page go live on your website. Repeat the process for adding more affiliate products to your website. Once you have added a few products from Amazon, you can go and visit the shop page on your website to see the products in action. By default, WordPress comes with a basic design with limited WooCommerce support. You can change that by picking up a WooCommerce ready WordPress theme that compliments your products and niche. 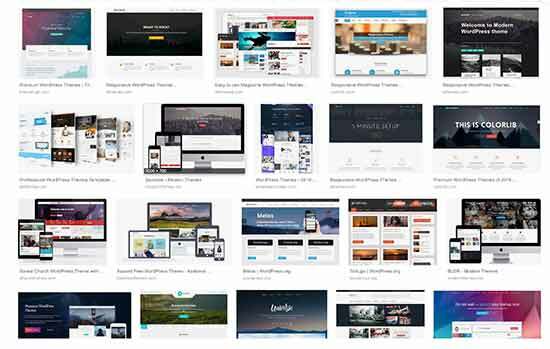 There are thousands of WordPress themes that you can choose from. This abundance can be quite overwhelming for beginners. This is why we hand-picked the best themes that you can start with. 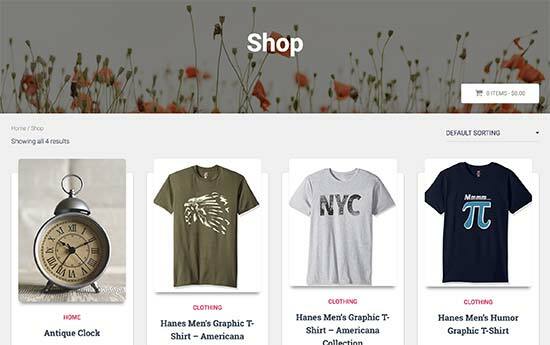 Best WooCommerce themes – A large collection of the best free and paid WooCommerce themes that can all be used for a WooCommerce Amazon affiliate store. Best WordPress themes for affiliate marketers – Our pick of themes suitable for affiliate marketing websites like an Amazon affiliate shop. Need help setting up your WordPress theme? See our beginner’s guide on how to install a WordPress theme. Themes control the appearance and design of your website. If you want to add a new feature, then you will need to find a WooCommerce plugin offering that feature. There are tons of WooCommerce add-on plugins to add different features. See our list of best WooCommerce plugins to try out some new features on your store. If you want more control of your website’s look and feel, then we recommend using Beaver Builder. It is a WordPress page builder plugin that works seamlessly with WooCommerce. Now that you have set up your Amazon affiliate store, you can focus on growing your business. Fortunately, there are many tools, plugins, and resources that will help you achieve those goals. Let’s start with SEO and optimize your WooCommerce store for search engines. Follow our step by step WooCommerce SEO guide for complete instructions. After that, you can check out these useful tools and plugins for Affiliate marketing and the essential WordPress plugins for all websites. Next, you need to track your website traffic to find your best selling Amazon affiliate products as well as products that are not doing so well. This is where you’ll need Google Analytics. For details see our tutorial on how to track WooCommerce users in WordPress. The biggest hurdle any eCommerce store faces is abandoned carts. For an affiliate store, this means people looking at the products but not buying them which affects your affiliate earnings. To fix this, we have a detailed guide on how to recover abandoned carts and boost your commissions. Above all, make sure that you are continuously adding useful products, helpful reviews, and targeted content to your website. In the end, that’s what your users are looking for and that’s what you should strive to offer them. Since we first published this article, we have received several questions from our users about running an Amazon affiliate store using WordPress. Here are the answers to some of those most frequently asked questions. 1. Can I use content from Amazon for product pages? No, you cannot. Amazon has a strict content policy where you are not allowed to copy product content directly from Amazon. Most Amazon affiliate stores add their own product descriptions, reviews, and get images from the product manufacturer’s website. 2. Can I add products from other affiliate networks? Yes, you can add affiliate products from other affiliate networks. This will allow you to diversify your earnings. 3. I live outside the United States, can I join Amazon Affiliate program? Yes, you can. Amazon Affiliates program is available all over the world. 4. Do I need to disclose my affiliate partnership? Yes, you do. Amazon’s program policies and the US laws require you to disclose that you’ll earn a commission when users buy a product. It is not just limited to Amazon, all websites that use advertising or affiliate marketing to make money are required to do so. For example, see WPBeginner’s disclaimer page. 5. Can I promote Amazon products without creating an affiliate store? Yes, you can. For example, if you run a blog, then you can add affiliate links to your blog posts. In that case, you will not need to install WooCommerce. We hope this article helped you start an Amazon affiliate store using WordPress. You may also want to see our ultimate step by step WordPress security guide for beginners. The post How to Build an Amazon Affiliate Store Using WordPress appeared first on WPBeginner.